Vitamin E is a fat-soluble vitamin, which means your body stores it in fat tissues and uses it to produce red blood cells and activate vitamin K, which is necessary for blood clotting. Vitamin E is also an antioxidant that might help prevent organ, bone and tissue damage from free-radical molecules and lipids in your bloodstream. However, this vitamin might pose several health risks. Vitamin E might impair your body's ability to clot blood, according to the University of Maryland Medical Center. Proper blood clotting is necessary to prevent excessive blood loss from internal and skin wounds. The risk of impaired blood clotting might increase if you take aspirin or prescription anticoagulants such as warfarin or clopidogrel. Vitamin E supplementation might increase the risk of hemorrhage during surgery, particularly in infants, notes the Linus Pauling Institute. 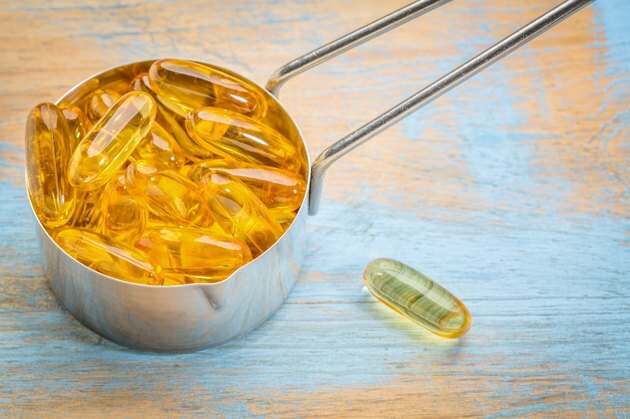 Vitamin E might negatively interact with several medications and might decrease the absorption and effectiveness of tricyclic antidepressants, particularly desipramine, according to the University of Maryland Medical Center. It might also interfere with the absorption of chlorpromazine, an antipsychotic medication, as well as beta blockers used to treat high blood pressure and statins used to elevate high-density lipoproteins in your bloodstream. This vitamin might also reduce the effectiveness of chemotherapy drugs, although evidence is not conclusive. The Food and Nutrition Board of the Institute of Medicine has established a tolerable upper limit of 1,500 international units per day for adults, which represents the maximum daily dose that is considered generally safe, according to the Linus Pauling Institute. Pediatric tolerable upper limits range from 300 IU per day for toddlers to 1,200 IU for adolescents. No established tolerable upper limit exists for infants. The daily recommended intake of vitamin E for proper health is significantly less than the tolerable upper limit, which means that meeting your recommended intake typically poses little risk to your health. The recommended daily intake for adolescents and adults is 22.5 international units, according to the University of Maryland Medical Center; however, breastfeeding females should consume 28.5 IU daily. Pediatric recommendations range from 6 IU for newborns to 16.5 IU for pre-adolescents.